Larnaca is set to see the construction of a Mall within the next 18 months, while local authorities prepare to address challenges it will bring along. The Larnaca Municipality announced that the town planning permit for the Metropolis Mall has been issued, after the final touches were added to the contracts. Mayor Andreas Vyras said that the building permit will also soon be issued. However, the he agreed that the development does not come without its share of negative effects. While the town’s municipality has already pocketed some €100,000 from the various licensing, another €2 mln is expected to find its way to municipality coffers as part of a deal made between the South African developer company Acsion Ltd. The money will be given as a form of compensation by Acsion and it is to be used to revitalise the town’s commercial centre. Larnaca’s Mayor Andreas Vyras told the Financial Mirror that the town’s commercial heart will to some extent be negatively affected as studies have shown. The cost of the South African investment is estimated to reach €60 mln and as the investor has stated, the whole project will be ready within 18 months from the day of the issuance of the building permit. Larnaca’s Mayor told the Financial Mirror, the project is to receive its building permit next Wednesday. 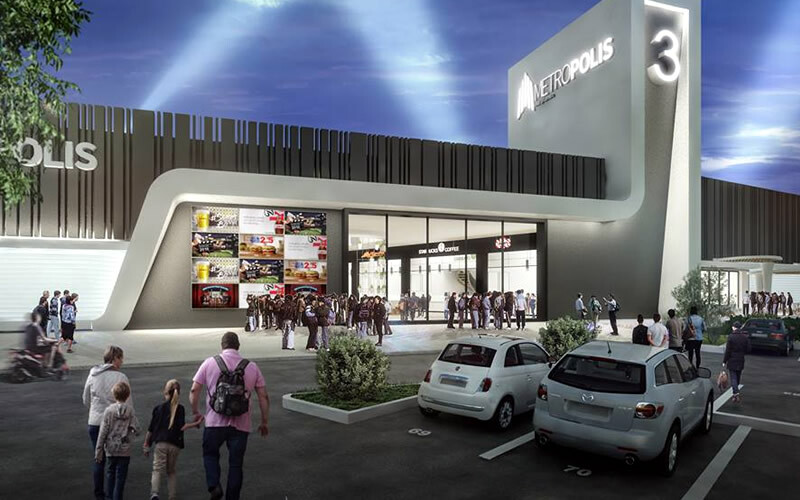 Metropolis Mall, which is to be built by the South African company on land belonging to the Church, covering an area of 33,000 sq.m, located behind the town’s military training camp (KEN) and opposite of the parking lot of the new GSZ Stadium. The mall is to host over 100 stores, a supermarket, a cinema, as well as accommodate 1530 parking spaces. Commenting on effects the project is to have on the town, Vyras said that it is expected to present a challenge for local authorities. “Investments of this size always bring along some positive effects, such as job opportunities and add value to the area. However, they do come with some challenges that we need to address. Such a big mall will of course put stress on local small to medium businesses”, said Vyras. He said that municipal authorities will do all that they can to minimise the impact on local shopkeepers. Vyras said that despite the challenges it presents, the Metropolis Mall has a role to play in the overall development of the town. Apart from the Mall, the town is set to see significant development in almost all areas of life. The municipality alone has four projects worth €13 mln in the pipeline. “On 24 September the project to upgrade the Municipal Market, worth €6 mln will begin, while projects like the renovation of the community centre and the (historic) English Club, worth a total of €5 mln are in the pipeline,” said Vyras. There will also be a €2 mln road improvement project which is to kick-in before the end of the year. Apart from municipal projects, private sector initiatives will change the town’s image significantly. Vyras said that a total of 12 hotels are either being built or in the process of acquiring the necessary licenses. Two of the hotels are to be built in the popular McKenzie area, while a five-star hotel is to be built on the Phinikoudes seafront by a Russian investor. And the first business-focused hotel – the Radisson Blu also recently opened in Larnaca. Larnaca’s mayor also spoke of the construction of four high-rise buildings which are to be reviewed by the town’s council for licensing. He also added that a series luxury flats are to be built in the McKenzie area, as all licenses have been attributed. Asked to comment on the progress of redeveloping Larnaca Marina and the port, the mayor said that there was a delay in procedures and that an extension was given as differences arose between the government and the investor. The project envisages a 1,000-berth marina and port involving a development of up to 510,000 square metres but the Israeli investors are unhappy about the terms of the deal for a multi-complex site. “In any case the government has to deliver the final tender documents to the investor by 7 September and the Israeli investor has to get back to them by 5 October,” said Vyras. He said that the government needs to find ways to speed up procedures surrounding investments of the size of the Marina, adding that red tape is an obstacle for all investments or plans the municipality has for development of the town. “We feel that Larnaca has been neglected when it comes to development plans and investments. We consider these development plans important for our town and we believe that it is about time Larnaca gets its fair share of development,” said Vyras.